Coming up we’ll dive into a disturbing topic of just how far our nation has strayed from the Founding Fathers’ ideals when comes to sound money – with devastating effects on our freedoms and the economy. In my exclusive interview with George Leef of Forbes Magazine, you’ll also learn about the growing movement to restore gold and silver back into the monetary system. 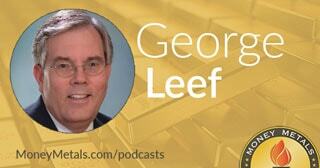 Don’t miss my conversation with George Leef, coming up after this week’s market update. Well, as the war drums are beating in Washington DC, markets are gyrating around the world. The most dramatic moves this week are coming in commodities and precious metals. Oil prices surged 8% to $67 per barrel through Thursday. That’s the highest level for crude since late 2014. Traders bid up oil futures on the escalating conflict between Saudi Arabia and Yemen as well as the threat of a wider war involving the United States, Syria, and Russia. The Trump administration imposed a new round of economic sanctions on the Kremlin, driving downside volatility in the Russian ruble and stock market and helping drive safe-haven demand into gold. President Trump also threatened on Twitter that the U.S. would hit Syria, as well as Russian forces there, with “smart” missiles. Trump’s bellicose rhetoric contrasts sharply with what he said on the campaign trail and earlier during the Obama administration. Tucker Carlson of Fox News is one of the few mainstream TV personalities raising serious questions about why the United States is preparing to inject itself militarily into another dangerous foreign conflict. Tucker Carlson: All indications out of Washington right now suggest a military strike against Syria could be imminent. President Trump tweeted as much this morning, warning Syria's ally, Russia, to get ready because missiles "will be coming, nice and new and 'smart!'" Speaking of smart, five years ago, in response to the last administration's plans to bomb Syria, Trump tweeted this: "Be prepared. There is a small chance that our horrendous leadership could unknowingly lead us into World War III." And yet, here we are, once again on the brink of something whose outlines and consequences are unknowable and terrifying. Those who claim there’s a deep state conspiracy that controls U.S. foreign policy regardless of who occupies the Oval Office may have a point. From the Bush administration to the Obama administration to the Trump administration, the U.S. has continuously pursued regime change objectives in the Middle East. George W. Bush ran as a non-interventionist candidate. He proceeded to invade Iraq and Afghanistan. Barack Obama ran as an agent of peace. He proceeded to stay in Iraq and Afghanistan and wage war for regime change in Libya. Trump ran as an outsider who would oppose nation building, reject globalism, and forge friendlier relations with Russia. That was then. Now Trump has filled his administration with war hawks such as arch neo-conservative John Bolton. Speaking of hawks, Federal Reserve officials are threatening to pursue a more hawkish monetary policy – at least if you believe their latest policy ruminations. On Wednesday, minutes of the central bank's last policy meeting were released. The Fed expects the economy to firm up and inflation to rise in the coming months, justifying further rate hikes. The Fed helped quash gold’s latest attempt to break out above its major resistance level. Gold prices rallied up to $1,370 an ounce mid-week before getting hit with selling pressure following the Fed minutes. As of this Friday recording, gold is moving up again and currently trades at $1,346, up 0.9% on the week. Turning to the white metals, silver shows a weekly gain of 1.7% to come in at $16.69 per ounce. Platinum is up 1.3% to trade at $932. And palladium has surged a whopping 9.3%, up $84 this week to $990 per ounce. Palladium’s big week comes on supply concerns out of Russia. Russia is a major palladium supplier, and the new round of U.S. sanctions could constrict the global palladium trade. Of course, all markets would get thrown into chaos if World War III breaks out. Let’s hope that doesn’t happen. There are a lot of bullish underpinnings for precious metals markets that don’t depend on a worst-case scenario unfolding geopolitically. In a best-case scenario, the back and forth blustering between the U.S. and Russia, Syria, and North Korea won’t lead to missiles being launched or troops being deployed. In a best-case scenario, ramped up military spending under Trump will serve as a sufficient deterrent to our adversaries. But it’s an expensive deterrent – one that will add greatly to our budget deficits. We face trillion-dollar deficits in the coming years – and with them, the prospect of a significant blow to the value of the dollar. Mike Gleason: It is my privilege now to welcome Forbes Magazine columnist George Leef. George is a hard money advocate and a law graduate who has dedicated his professional life to teaching and education rather than practicing law, and over the past fifteen years has worked at the James G. Martin Center for Academic Renewal, a free market think tank that takes a critical view of higher education. Underneath George's byline on any of his Forbes.com columns, you'll find the words, "I write on the damage big government does, especially on education." And today, we're going to get into just how uneducated many are when it comes to the government's heavy-handed role as to our money. George Leef: I'm very good, and my pleasure to be on with you, Mike. Mike Gleason: I'm excited to cover this topic with you and first would like you to brush up our listeners on the role the US government was originally designed to play vis-à-vis our money. And contrary to popular belief, nowhere in the Constitution do we find anything about granting our governmental overlords a monopoly power in the creation of money, do we? George Leef: No, we don't. The Constitution sets forth the powers that the government is supposed to have. In Article 1, Section 8, the powers of Congress are enumerated and that includes the power to coin money and regulate the value thereof and also the power to punish counterfeiting of US securities or US money. As I note at the beginning of my article, which is available on Forbes.com, that does not include the power to create a governmental monopoly in the creation of money. There would be no reason to think that the founders would have wanted such monopoly for several reasons. They had been unhappy with British monopolies like the East India Company that tried to sell them overpriced tea, and we know what happened to that tea. Mike Gleason: It was a certain amount of gold and silver grains, I guess, made up a dollar. They did have the ability to change that metric if they needed to, but that was the true backing. George Leef: That's true. They adopted a bimetallic system. The dollar was designed both as a weight of gold and a weight of silver, but they understood that the market value between gold and silver would probably change over time, which is what they meant when they said “regulate the value”. What they meant was that they could change the ratio between gold and silver as needed, which, in fact, Congress did in about 1834, as I recall, changing the ratio between gold and silver. I'm trying to remember whether it was gold that was starting to go out of circulation or silver because one was over-valued. Anyway, that's what they meant by regulate the value of money. Mike Gleason: Now as we turn towards the Bernard von NotHaus case that I'll ask you about in a moment, the role of government with respect to money was primarily, if not exclusively, to prevent people from producing fake money, counterfeiting, which you alluded to a moment ago. They've taken that notion and really expanded it, haven't they? George Leef: Yes. During the Civil War, Congress added a section to the criminal code, Section 18 of the United States Code, Section 486, which purports to make it a crime to produce coins that could be used in substitution for "the current money" of the United States. They didn't want competition with the cheap money the Union was producing during the Civil War. That provision still remains on the books and has recently become key in a case against a man who was producing what was called the Liberty Dollar. His name was Bernard von NotHaus. Oh, quite a few years ago, back in 2005 and earlier, he began producing a pure silver coin, which, of course, the US government itself stopped doing way back in the mid-1960s. They took the silver out of the coinage and just made these clad coins we now use. Mike Gleason: Yeah. They definitely feel like they should be the only ones that have the ability to counterfeit our money or what should have been money and definitely don't like other people doing it. I guess the fatal mistake he made was that he put the dollar label on those coins. Is that what I understand? George Leef: Yeah. He put the dollar sign on it, and the prosecution made a big deal about that. In point of fact, nobody who bought a Liberty Dollar could possibly have thought that it was actually United States currency. It was made out of silver, which our coins are no longer made out of. It didn't say United States Government on it. It certainly was not a case of fraud or of counterfeiting. It did not look like US coins. No one could have possibly mistaken them for US coins. Mike Gleason: Turning to the Federal Reserve's role in all of this, you alluded to it a moment ago. It seems that the current system is all about the Fed monkeying with the money supply, controlling interest rates, and even stepping into the market to buy literally trillions of dollars of bonds. This has not only created tremendous distortions in asset prices and bubbles, crashes, financial turmoil, but also the purchasing power of the dollar is down some ninety-seventy percent in the last century. Now in a column you wrote earlier this year where you reviewed a great book by Professor Richard Timberlake titled Constitutional Money, you quoted Timberlake as saying, "What we have learned is that the rule of experts, no matter how brilliant their credentials, is far inferior to the stability of a self-regulating market." Explain why you believe that to be the case. George Leef: I'm glad you brought that up, Mike. I'd like to encourage people to read this excellent book by Professor Timberlake entitled Constitutional Money, published last year by Cambridge University Press and which I reviewed on Forbes. What his argument is a counterargument to the progressive status argument we hear about, medical care, Obamacare, and many other things, that we have to rely upon government experts to get things right, whether it's medical care or the money supply or something else. If we turn it over to the right people, they will create the right circumstances for the country, and then we'll be just fine, but we couldn't rely upon market processes. Mike Gleason: Speaking of manipulation, we got a great example of that in past history. In the column you wrote about Timberlake's book, you also point out the Fed's policy decisions and immediate reaction to the early stages of the Great Depression made it much worse because they prevented gold from functioning as the monetary base. Gold ownership was made illegal in America. It was officially demonetized and then locked up in Fort Knox by the politicians. With gold drummed out of the monetary system and taken out of people's hands, they could essentially politicize the nation's economy. Why was that so detrimental? George Leef: That's precisely what the progressives, FDR and his New Dealers had in mind. They wanted to politicize everything, including the monetary system. That's why they confiscated gold; they made it illegal to make contracts for dealings using gold. They wanted to lock the people into dependency upon the federal government in every way they could, including the use of money. Perhaps the most striking argument in Timberlake's book is his point about how gold was locked away, seized by the government, put into Fort Knox. If that had not been the case, he argues, the money supply of the country would not have shrunk the way it did. That's what really caused the wave of bank failures and business failures that hit the country in the early '30s, lasting into FDR's first term. It was all the monetary blundering of the Federal Reserve officials that made a bad situation much, much worse. Mike Gleason: Well this notion of free currency and the resurgence of precious metals is an important monetary asset across the globe. It seems to be gaining traction even here in America, particularly in several states, that the US Constitution says that states should recognize gold and silver coins as legal tender in the payment of debts. We're seeing several states, Utah being the first, if I'm not mistaken, formalizing this through legislation in the past few years. So this is an issue on the rise and thank goodness more people like you are talking about it. You've covered this a lot. Are we gaining traction in this area? George Leef: Oh, I think people are becoming more and more nervous about our monetary system as the federal debt continues to go up and will no doubt continue to go up at an exponential rate. People are going to get more and more nervous about money and they're going to start asking the right questions about what has the government done to our money? What should our monetary system really be like? What are the alternatives to this system we have where the supposed experts in the Federal Reserve just crank out as much money as they think is ideal. This is going to gain traction. I think we'll see more states taking these kind of steps, which they're perfectly entitled to do under federalism, to allow people to make their own transactions however they want to. That's the freedom that the founders envisioned. Maybe it's due for a comeback, and I think we're going to start seeing it. Mike Gleason: It definitely starts with education, and you're, of course, at the forefront of that. We definitely appreciate what you're doing there and certainly thank you for your insights and the works you're doing there at Forbes.com, and we hope we can visit with you again as this all unfolds. George Leef: Oh, absolutely, Mike. Glad to be on with you. Mike Gleason: Well that will do it for this week. Thanks again to Forbes columnist George Leef of the James G. Martin Center for Academic Renewal.